Several people on several occasions have told me about Humdinger’s and how I need to go check it out. Well, I finally did one evening, for a much needed get-together with my friend Eula. Humdinger’s is counter service, but they also have lovely staff member to come around and check on you as well. Everyone is very nice! They serve fresh fish and piri piri chicken in many different ways. I was excited about this, as there are not many reasonably priced places around town where you can find many fresh fish options. If you want it, you basically have to pay upwards of $25.00 an entree, or you have to go with the frozen kind (which is not always terrible). Your choice. A Memphian, a transplant from California, and a South African restaurateur, all with a love of great food, came together to pursue a common passion: They believed casual cuisine could be healthy, flavorful and affordable. They decided to explore the idea of creating flame grilled, mouth watering entrées using unique sauces. Knowing health and wellness was becoming important to a discerning clientele, they chose to build their entrées around freshly grilled gourmet fish, chicken and vegetables. They created unique recipes, many using the legendary Piri-Piri spice from the coastal regions of Southern Africa. 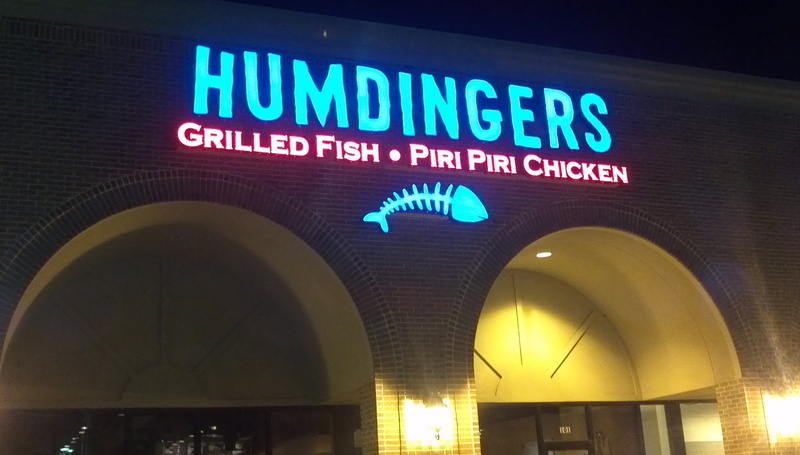 As a result, at Humdingers you can enjoy a mouthwatering array of hot and healthy dishes straight off a fiery grill. I was highly impressed with all of the options that this place had. I had a hard time figuring out exactly what I wanted! I did know that I needed a drink, after working several long days in a row. I ordered wine, but they did not have any. That was okay with me, as they also had Samuel Adams. Sold. Their menu is decently extensive, but I chose one of the fish platters. You choose your fish, choose your topping, and choose your side. It also comes with rice. I had never heard of either Amberjack or Triggerfish, so I googled both to see what they were like. The Triggerfish got better results on Google, so that is what I went with. I chose the pineapple salsa as my topper and grilled sweet potatoes as my side. 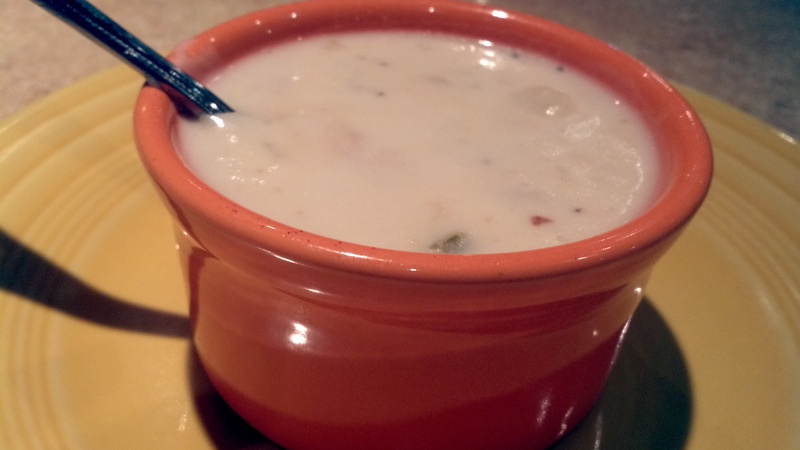 I also got a cup of New England Clam Chowder. 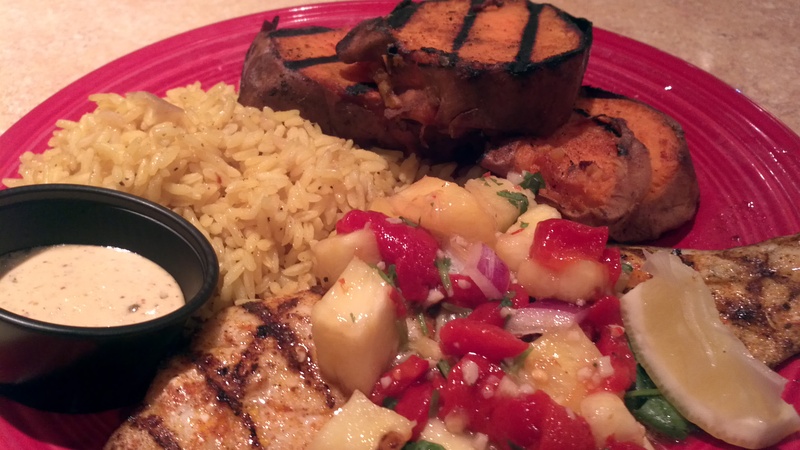 Eula got the Grilled Tilapia, covered in pineapple salsa, with a side Caesar salad. Eula said her meal was really good. I loved mine! 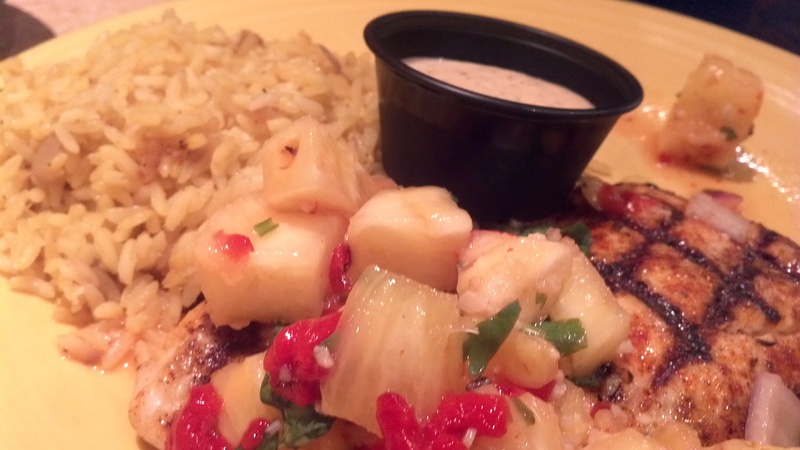 The fish was very flavorful and flaky, and the pineapple salsa was sweet, but not too sweet. It also had a good kick to it as well. The grilled sweet potatoes were fantastic. They were cooked perfectly and had a great, spicy seasoning on them. I do not prefer my sweet potatoes overly sweet, covered in sugar, butter, etc. These were not that. You could taste the natural sweetness of the potato, along with the spiciness of the seasoning. The clam chowder wasn’t the best I have ever had. It did not have as much flavor as the rest of the meal, but it was still good. 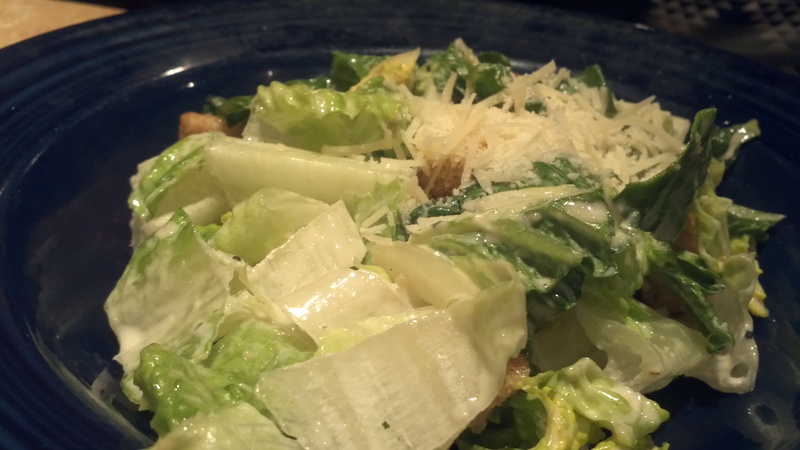 It was wonderfully creamy and full of clam and other yummies. They didn’t skimp on ingredients. Overall, I am only upset that I did not try Humdinger’s sooner. It is the perfect place to find a healthy meal at a great price that still has a lot of flavor! You just can’t find that in many places around town. I will definitely be back again. I just wish there was a location closer in town. For more information on Humdinger’s, check out their website, Facebook, or Twitter. You can also find more reviews on Yelp, Urbanspoon, and Trip Advisor. You can also find out more about their history in the Memphis Business Journal write-up. Hey girl! Just read almost the entirety of your blog! I love that I learn so much about the city I have lived in almost my whole life! I didn’t even know most of these places existed! Alex and I are definitely going out to dinner tonight! HAHA! Loved reading the blog that I was a part of! Keep up the good work! Wow girl. Thanks! If you and Alex ever need recommendations, let me know! Also, feel free to be a part of my posts any time.